From candidate recruitment to layoffs, business practices that may be discriminating against older workers are making headlines. According to a 2017 article by AARP, older workers are fighting back in court. For example, in one case from 2015, a systems engineer filed a lawsuit against Google after applying for four separate positions between 2007 and 2014. Cheryl Fillekes claims “that one Google recruiter even told her to put her graduation dates on her resume” to allow interviewers to see her age. Google has denied the claims. Although the lawsuit is in the discovery phase, at least 269 others have joined the suit. While cases of age discrimination can be found across industries, career and legal experts believe it’s more widespread and prevalent in the IT industry. Although laws against age discrimination have been around for more than 50 years, older workers feel age is affecting their chances of getting a job, keeping a job and getting promoted. According to a 2017 survey by career website Indeed.com, 43% of tech workers “worry about losing their job because of their age.” Additionally, more than one-third of respondents said they experienced at least one situation where they weren’t taken seriously by managers and colleagues because of their age. Many older workers with years of experience face negative stereotypes like they are not well-versed in the up-and-coming technologies and unwilling to blend into the startup culture. When people think of Apple, Google and Facebook, they may think of young tech workers who wear sneakers to work and spend lunch breaks playing foosball. True, many tech giants are known for offering a variety of perks including onsite activities to help relieve stress. 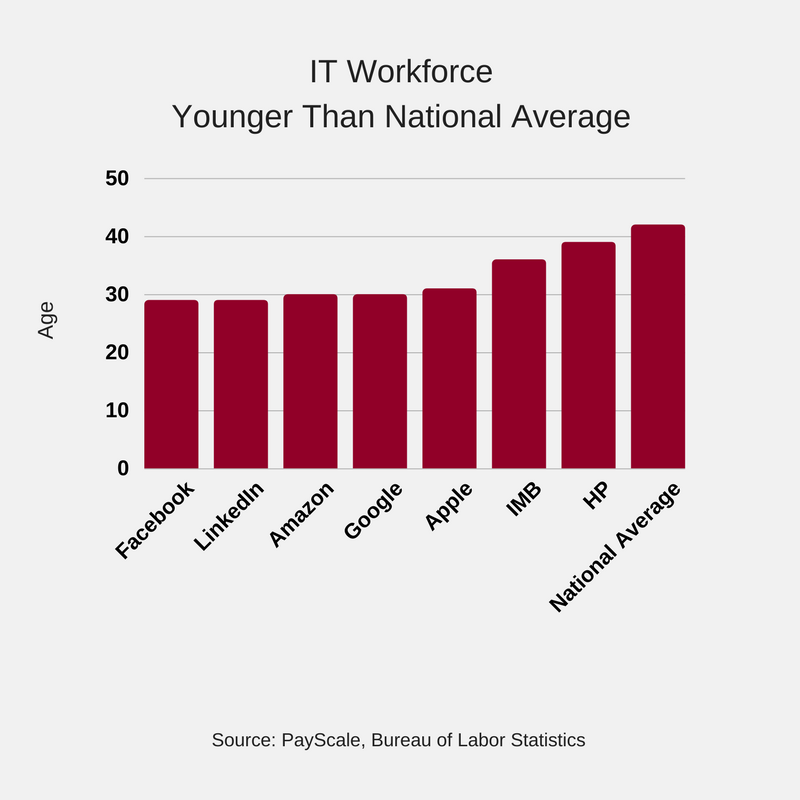 What is also true is that the median age for many global organizations remains below 40, according to PayScale’s analysis of IT employee data including salary, gender, age, satisfaction and employee experience. Employers can take several proactive steps to prevent both unconscious and clear ageism or bias from affecting employee treatment. Below are six tips for employers and managers. Set an example from the top. According to Connell, “Business leaders should not only avoid ageist comments, they should set the tone that the company needs to keep its best people, not that it needs to get rid of the good old boys. Choose job posting terminology carefully. According to a 2016 article in Fast Company, specific verbiage can unintentionally sway candidates to skip applying because they think they are too old. For example, “digital natives” implies that the company wants candidates who grew up using technology, candidates who are younger. Implement an employment discrimination policy. This policy should include all forms of discrimination, harassment and retaliation. It should also include a process for reporting incidents with several methods to do so if a manager or supervisor is involved in the issue. Deploy mandatory diversity training. Organizations should hold training sessions that address employment discrimination, the company’s policy and complaint process. Information should also address how to create a nondiscriminatory work environment. Establish regular diversity reporting and initiatives. For example, in 2016, Atlassian released its first diversity report, which revealed team-level diversity data. The report evaluated progress on diversity initiatives and diversity numbers. Follow a disciplined approach to reducing staff “that avoids a subconscious lower ranking of older employees”, Connell explained. Know your rights. If you believe you have been discriminated against, you should contact your employer or manager right away to inform them that you are aware of your rights under The Age Discrimination in Employment Act of 1967 (ADEA). Socialize with your coworkers. From happy hours to 5K fundraisers, organizations are thinking of more ways to keep workers engaged and enhance the overall experience. Team social events can help all workers get to know each other outside of the office. Former Google employee Karen Wickre’s tip: “make sure everyone feels comfortable about socializing in whatever way and at whatever time you think will be so much fun.” In some cases, it means omitting paintball or pub crawls, Wickre notes in her 2017 article published on Wired. Participate in reverse mentoring. These programs help connect older workers with recent college graduates or junior employees who may be well-versed in the latest tech tools but lack what usually comes with age – professional experience. This type of multigenerational learning initiative can also help combat workplace bias. Continue your education. Stepping outside of your comfort zone and going back to school can arm you with new tools, techniques and knowledge to stay relevant in your role or pursue a new related career path in IT. The efforts to combat ageism must be pursued by all parties to ensure older workers receive equal throughout all aspects of employment.